 Guaranteed ±.006" or ±.005"
• Available in gold, or clear UF. • Available in T12 and T8 sizes. 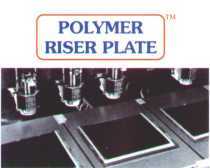 POLY-TEST is a polycarb test fixture blank available cut to size. SPC/PPC also offers: Polymasking rolls, Soft Tooling Plate Plugs, Dessicator Cabinets, Solder Pallets, as well as standard distribution plastics; Unclad G-10, CDM, Mechanicals.